iPhone 4 users come and rejoice as one incident proved how strong and durable iPhone 4 can be. 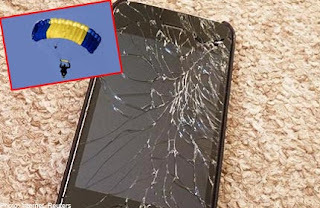 An iPhone 4 survived a 4,115m fall after a certain Jarrod McKinney went sky diving. The 37-year-old McKinney forgot to unzip his pants before jumping the plane which resulted the iPhone's self destruction. McKinney was able to track the whereabouts of the iPhone through GPS application (Mobile Me). He was making a prank call to his phone when it suddenly rang. KcKinney told that he was still able to make calls to his iPhone even though the screen is shattered. If you like this post, buy me a cup of coffee.